A user posting on reddit and in the MacRumors forums has given a detailed account of their findings and attempts to circumvent the throttling previously discovered on the new MacBook Pro 15" models featuring the six-core i9 Intel CPUs. The user goes on to explain that one of the internal power limits set for the device may not be appropriate for the power draw of the CPU and identical to previous MacBook Pro models, causing the power delivery chip (known as a voltage regulation module, or VRM) to report an over power condition that forces the clock of the CPU down to scale back power. This sets up the same conditions to allow throttling to occur once again. These conditions may be presenting themselves due to the new six-core design of the i9 CPU featured here. While Intel increased the core count of the CPU, they did not increase the thermal design power (TDP), or the amount of dissipated power manufacturers should plan to have to cool for a proper CPU design. This is an issue because this number usually reflects normal usage, and does not account for turbo modes. It's also likely it can exceed the draw of previous four core CPUs given the similarity of clock speeds and process nodes they are featured on. A method for tuning this limit is provided in the post, but it requires executing a command manually or via script each time the computer boots, and would likely void the warranty if Apple technicians discovered it. Still, the user posts results of benchmarks showing successive runs with no throttling. Manufacturers will always quote likely reduced component lifetimes if used outside of their specifications, but the results appear stable, and there is no thermal throttling of the CPU, the original suspected cause of this issue. This fix will not address total system power draw becoming excessive, such as long sustained loads from the CPU and GPU, but it is possible Apple could issue a fix similar to the one outlined in the reddit post that is stable. As for whether this issue is related to the hardware design of the MacBook Pro, that is possible as well. While iFixit's complete teardown of the current 15-inch MacBook Pro is not yet available, the previous teardown reveals significant differences in the VRM chips that power the GPU and CPU of the device. 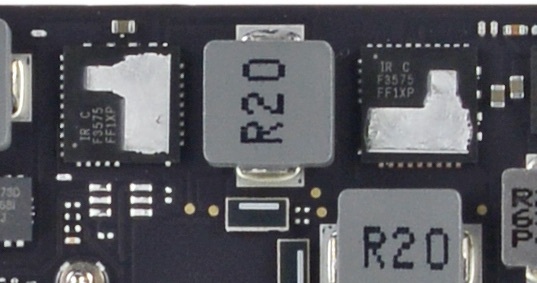 The GPU power components seen above are on the top side of the logic board near the GPU die, and thermal grease can be seen on the components, indicating that they interface with the heatsink in the device. This is in contrast to the same components for the CPU, which are featured on the rear side of the logic board with no thermal interface to the top of the package, as seen below. Additionally, the publicly available data sheets for these parts indicate more differences that suggest their thermal profiles will be different. The International Rectifier part for the GPU features a lower thermal resistance, meaning it can better dissipate its heat to the surrounding areas (board, air, heatsink) than the Intersil part for the CPU. Additionally, it boasts a higher power efficiency, meaning it dissipates less power itself to deliver the same amount of power as the Intersil part. Along with the heatsink path provided for the IR parts, it's clear they will not be capable of driving the same amount of load in any sustained mode. This makes sense given GPUs can see high loads for longer periods, but this could be an area of improvement for future MacBook Pro models from Apple, especially since it has typically chosen GPUs with very similar thermal design power limits (TDPs) to the CPUs in its MacBook Pro line. Sounds like an Intel issue. Just another reason for Apple to drop them and begin using their own chips. Intel certainly isn't helping themselves here. It's not an Intel issue. Or it didn’t know because it didn’t adequately performance test it. All Apple had to do was run this test to see the issue. Apple isn’t even trying anymore. They know we’ll buy it anyway. I don't understand how anyone could think this is anyone but Apple's fault... Intel sells the same chips to everyone - in volumes that make sales to Apple look like a rounding error. If there was a problem with the chips, that would be the story because EVERYONE would be screaming. Intel share prices would take a beating, etc. Even if Apple made their own chips, the same thing could happen. This comes from somebody either not bothering to test, or the tests not being aligned to actual use... Or maybe the test unit being different from what was actually manufactured at the factory in China, in which case it's a quality control failure. Nobody buys an i9 to just surf the web and leave it idle most of the time. Measurements clearly show this fixes the problem. ¯\_(ツ)_/¯. Maybe you're just in denial. Apple ****ed up hard. This is very sad, Apple is so focused on iPhones, they have forgotten the power users who actually make content and Apps for iPhones, Macs and iPads. You feel wrong. Who designed the board without complying with the correct specifications needed for that processor, using a voltage regulator design that is clearly insufficient for it, thus overheating? Apple. I feel this is more Intel's fault. Apple is caught in the middle, power users want the latest and greatest chips and Apple is trying to fulfill that request, but Intel's ability to deliver is lacking. This isn't just an Apple issue, any other manufacturer that uses these chips is going to have the same issues. Considering that apple basically adds an extra 0 to $ amount of everything, they should have figured this out. Oversights like this just give more credence to rumors that the Mac team at Apple has been gutted by resignations and retirements over the last few years. Once upon a time, people like me paid a premium for Apple products knowing that the beta testing had already been done. Now, I have a difficult time determining which Mac I find to be the least compromised and objectionable. Looks like third time’s not a charm for this MacBook Pro. Between the keyboard problems, thermal issues, and dongle hell, I think this generation of MacBook Pro will live in infamy alongside the "trash can" Mac Pro.